Hagstrom's best Super Swede yet offers very viable competition in the classic, single-cutaway electric stakes. Build quality. Playability. Impressive pickup performance. The cutaway's slim size restricts upper end playing space. When launched in 1971, the Swede was essentially Hagstrom's Les Paul, likewise the partner Super that followed six years later. Since the re-launch of Hagstrom electrics in 2007, most models have been based on the brand's earlier designs. As this maker's most successful models from the seventies, the Swede and its Super stablemate naturally feature prominently in the revived range, with the current crop now numbering 14 varying versions, including the new Northen Series. "Rather than being produced in China, these latest examples emanate from Europe, in the Czech Republic to be exact"
The latter's name suggests closer ties with Hagstrom's home turf, while manufacture also moves nearer. Rather than being produced in China, these latest examples emanate from Europe, in the Czech Republic to be exact, courtesy of an instrument production base that dates back many decades. The four-strong Northen line is led by the Super Swede Flame, which, apart from an appropriately figured front, has all other features in common with its three companions. Like the majority of modern Hagstroms, this model is topped by the large, asymmetric headstock first seen in 1969 and designed by leading US luthier James D'Aquisto. The ornate outline is emphasised by multiple edge binding and accommodates art deco-style machine heads that also hint at Hagstrom's history. This maker has long had a liking for synthetic fretboards and the Northen Super Swede sports the sleek, 'resinator' wood composite fingerboard that's been featured across the rest of the range since the brand reappeared. Edged with maple binding, it emulates real ebony, and here's hoping that future refrets don't face the problems posed by the plastic playing surfaces the firm once used. Early Hagstroms were famed for super-slim necks, but these days the preferred profile is decidedly meatier and more mainstream. Unlike its more Gibson-orientated Swede stablemate, the Super version favours a Fender-ish, 648mm (25.5-inch) scale length to accompany a 22 fret count, while rounded-corner pearl block position markers point to the brand's past. When launched in 1971, the Swede was essentially Hagstrom's Les Paul, likewise the partner Super that followed six years later. Body-wise, both were a bit bigger all round and these measurements have stayed the same, but even so, the Northen weighs a very shoulder-friendly 3kg. This is certainly less than some other current Swedes and, although Hagstrom doesn't say as much, it's light enough to hint at hidden airspace within. 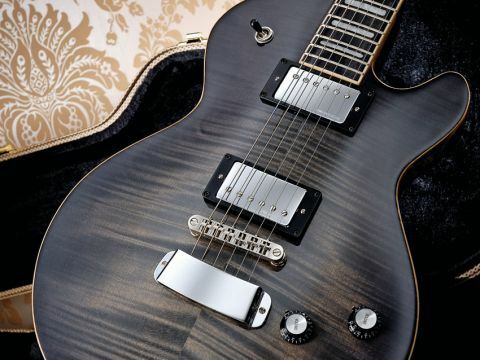 Construction comprises the classic mahogany with maple top combination and the latter's flamed figuring looks good under the review example's cosmic blackburst finish, this being contrasted by natural maple binding around the front. A feature of the Northen Series models is the presence of twin humbuckers designed for Hagstrom by Swedish pickup specialist Johan Lundgren. These are partnered by a Les Paul-like control layout, augmented by a pull-push, coil- split switch incorporated into each tone pot, rather than the separate mini-toggle selector seen on other Super Swedes. The six-saddle bridge is very obviously influenced by the standard tune-o-matic design, but the tailpiece is a piece of pure Hagstrom design, combining a curved cover with a similarly shaped, clear plastic baseplate that carries six string anchor blocks. An airy acoustic character translates to equally open-sounding amplified performance. This comes courtesy of humbuckers that combine impressive definition with beautifully even-tempered tone. The end result is a sound that consistently stays focused and expressive under clean or gain-laden conditions, allowing subtle nuances and aggressive, attacking extremes to be conveyed with ease. The single-coil selections leave each pickup's outer coil in operation, predictably lowering volume levels and thinning out the sound, particularly so in the bridge position. These alternatives increase versatility, but the innate clarity of the humbuckers renders such options less useful than usual. Although the Northen Super Swede Flame incorporates various construction and component upgrades, many aspects are still shared with Hagstrom's much cheaper, Chinese-made alternatives, making the latter a hard act to follow in terms of overall value for money. That said, this very classy new Super Swede is undoubtedly a superior instrument to its predecessors, which is obviously intended to target the more discerning player; one who can best appreciate, utilise and afford the extra quality on offer.